11 million+ new graduates every year through colleges, diploma centers and private training institutes in India. Most of these candidates are unable to find a job since the majority of India’s jobs are available in top 5 metro cities while colleges and training institutes are spread throughout the country. Due to financial reasons and poor infrastructure, the majority of these job seekers are unable to travel to metros in search of a job. These people have no career guidance or information about employment opportunities available and nobody to guide them about it. This is the problem in most of developing countries like India and we want to fix it. 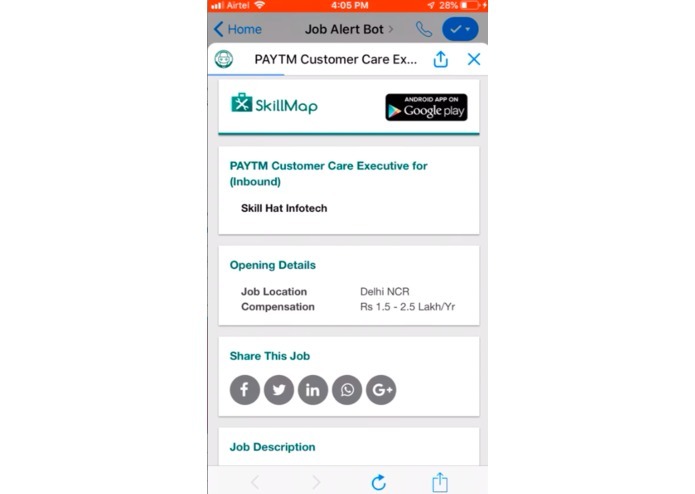 SkillMap provides level playing field opportunities for the job seekers in non-metro areas using technology by eliminating distance as the major issue in screening the right candidates. 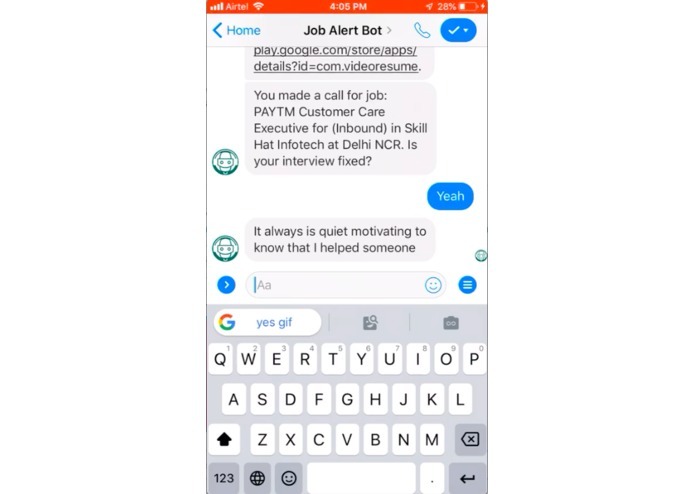 We identify employable candidates using remote assessment on mobile & chatbot and connect them to relevant companies. We have also built the largest database of entry-level jobs (60K jobs) in India. Our remote assessments are capable of screening for 40+ skills demanded by industry. We also have an on-demand asynchronous video Interview app to assess the presentation and communication skills of candidates. 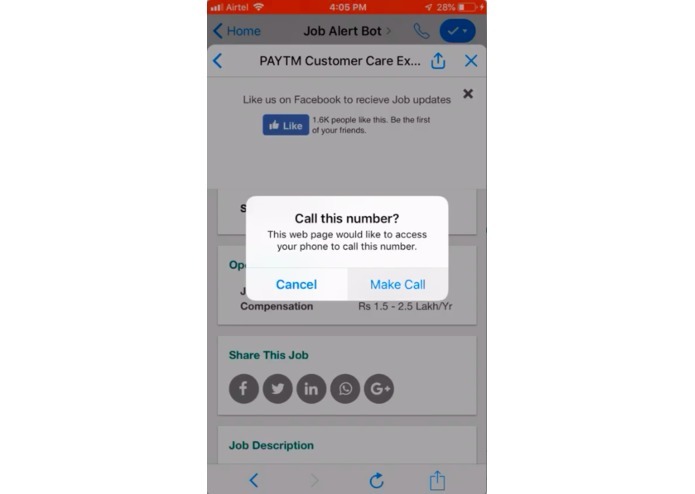 Our assessment and video interview apps work perfectly in the intermittent and slow network connection which are pretty common in India. Our app works on entry level android devices costing 50$. The platform also helps these job seekers in career guidance. Most of these job seekers are unaware of the latest job trends. 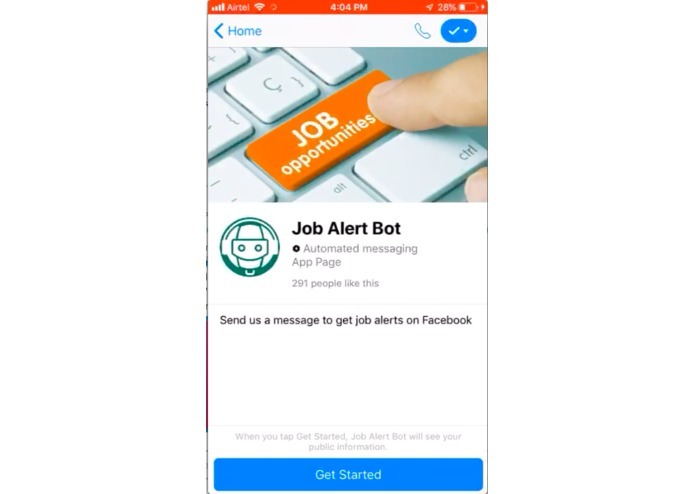 We have built a chatbot called Job Alert Bot on Facebook messenger platform to help them with career guidance and interview preparation. Most of these jobseekers don't know how to make a resume. Our Free Resume Builder app helps them in creating a professional resume at free of cost. We are also building an instant game, it will be a fun way of challenging others in skills required in jobs required by industries. We will use the game data to find out candidates suitable for a particular job. There is no reliable job board in India which covers entry-level (0-4 years experience) jobs. So we created crawlers to aggregate jobs in this segment. We built app based assessment where proctoring happens through the front camera of mobile. 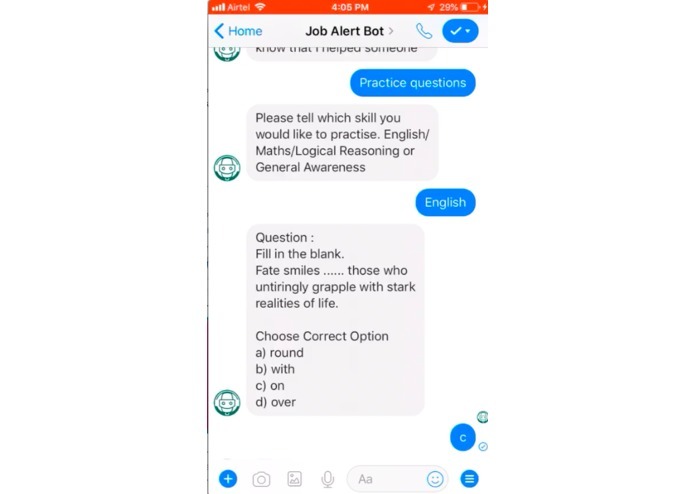 Later, we built the job search and assessment into a facebook messenger based chatbot. Our bot was launched recently and is already getting about 500 users on daily basis on Facebook. Building a versatile crawler to get live job information was an initial challenge. Later building a job recommendation engine was challenging. The most challenging task is the one we are facing right now is language. India has 22 major languages and candidates tend to type in any of them which talking to our bot. We conduct 100+ tracked interviews every month with about 9000 calls to recruiters originating from our platform every week. 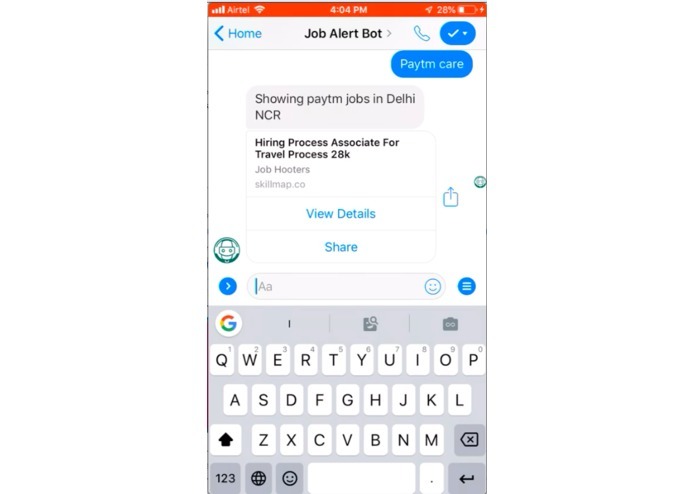 Our apps and chatbot have been used by 150,000 + jobseekers so far. We are one of the selected incubated companies at IAMAI. We have closed our seed round from one of the top impact investors in the world Unitus Ventures. Even though remote assessment is the way of identifying the right candidate, jobs are the most important part of service and that's what the job seekers care about. We measure our impact by tracking the number of people who interviewed and got jobs via our platform. 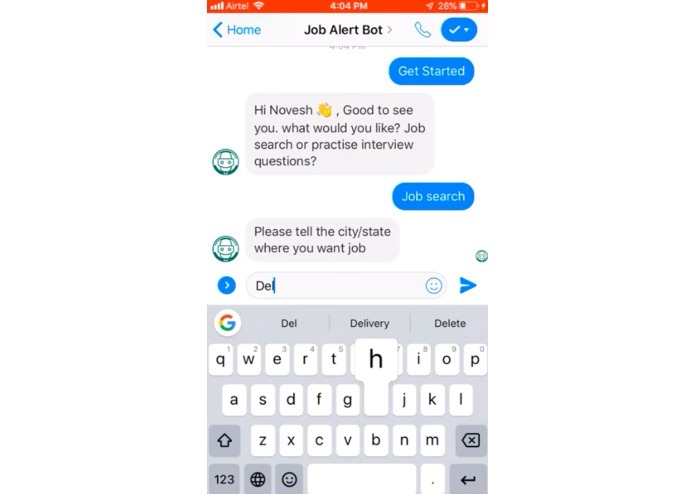 We want our chatbot to be the go-to person for these millions of job seekers when it comes to career guidance and job search. As of now we are able to address 70% of cases satisfactorily and want to improve on that number by training our ML engine better. Additionally, we want to the bot to help them in asking the right questions and have better conversations. Since it is not possible to have people deployed at such a large scale and geographies, we believe chatbot is the best way to solve this problem. We are planning to launch the chatbot in 8 different languages by next month in order to cover the majority of India's vernacular users. We have also built an instant game where users can challenge other users and compete on skills usually asked by the industries. We will use these game to access potential employable candidates and connect them with industry. We are planning to add some game mechanics elements in this game over the next 1 month. There are millions of employable job seekers in developing countries which can be the growth engine for companies worldwide, in the long run, we want to use this platform to provide quality crowdsourcing by these people. Our gamified assessments can enhance the quality of these marketplaces significantly. Professor Panos Ipeirotis of NYU has described it nicely in his article - Mechanical Turk, Low Wages, and the Market for Lemons. Moreover providing the first ever employment opportunity and feedback to these job seekers can be life-changing for these job seekers. Amanda Pallais of Harvard University has a really nicely detailed research paper on it (Inefficient Hiring in Entry-Level Labor Markets). First: Jobseekers can now create a professional quality resume builder using our bot. Excited about 2 new features to be released today. Updates coming soon. New feature roll-out: Candidates can apply on a job via a direct link. The bot will handle everything. Our chatbot is now handling 95% of user queries successfully. We are getting good traction on Facebook and already 300+ users are using it on daily basis. Some new features to be rolled out in a few days.